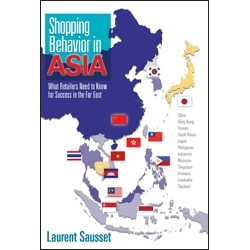 "Shopping Behavior in Asia by Laurent Sausset"
The Far East will be the next middle-class market for retailers and manufacturers in all categories. Name brands are especially sought, especially when they are sold by department stores where customers can be assured that they are not fakes. Retailers like Tesco, Walmart, and Carrefour are already in the region, but there is plenty of room for more modern retailers as consumers gain more discretionary income. Laurent Sausset has been surveying customers in the Far East for many years through his company, DistriSurvey Ltd. He understands their likes and dislikes, shopping behaviors, and the differences among them, by country and ethnic background. 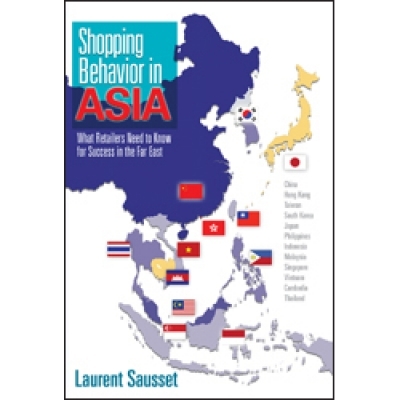 In Shopping Behavior in Asia he discusses all aspects of retailing in the region including such topics as location, parking and traffic patterns, promotions, product assortment, pricing, signage, customer loyalty, and employee training. He offers specific examples and recommendations for success, category by category. Whether your niche is appliances, packaged goods, furniture, books, DIY, personal care, sporting goods, or leisure products, you will find useful information that will lead to a better understanding of your potential customers in Asian markets. Seeing is believing in the minds of most Asian consumers and Sausset helps you “see” how to succeed in Asia. Price: The sole reason for selecting a store? Are Asians different when it comes to promotions?